There could be many things crawling in your crawl space – and just one visit to the Google image result could prove this space better not be neglected. When it’s time to clean, repair, or make sure rodents don’t get any access to it – give our team a call! Mice and rats love cramped, dark and moist spaces to hide in. After all these are the perfect hiding and breeding places for them, away from humans and cats – but not too far away so they can still sneak into your home and grab a snack in between. If the mere thought is horrifying to you, you’re not alone! Our experts have all the equipment to examine, detect, lure and trap rodents of all kinds, and safely removing them from your premise. We can also install special screeners and nets in order to prevent another infestation in the near (and far) future. Are These… Droppings? – Cleaning & Sanitization! Rodent infestation doesn’t end with the rodents being removed; They may have left, but their droppings, fleas, and bacteria might still be lying around in your crawl space. Worry not! Our experts will clean every nook and cranny, using special (and safe) sanitization solutions to make your crawl space safe to crawl and breath in once again, and by extension your home or business as well. We want to make the process as hassle free as possible, and so we make it a point to specialize in everything needed when it comes to taking care of your crawl space. If there’s any board out of place or any holes that need to be sealed – count on us to fix it. 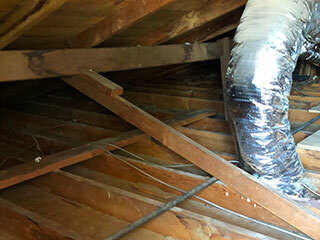 It is our mission to make sure that by the time we leave your home, your crawl space is in tip top condition! Don’t Delay – Give Us A Call Today! We at Attic Cleaning Irvine want to make sure you get the best for your money on every call. Be it for cleaning, rodent proofing, repairs or simply consultation – we are always at your service. Contact us today for any question, and let us know how we may be of service!